Are Some People "Hard Wired" to Overeat? Many overweight and obese people feel guilty about their weight. Many slim people who have never struggled with their weight can be negative and judgemental about people who DO struggle with their weight. A new study shows that many people who struggle with their weight simply are "biologically wired" differently than naturally slim people. To put it simply, it is not a level playing field. Many people who are naturally slim may have it easier than those who struggle; their brains simply do not respond the same way to the sight and smell of food. If you struggle with your weight, do not despair. This study does NOT mean that all hope is lost! It does mean that you will have to take extra care with your environment, so you are not surrounded by "cues" that lead to overeating. At Physicians Healthy Weight Center we help our patients uncover factors that lead to unhealthy choices; we create specific plans to overcome these challenges, and then we help put the plans into action. Planning, preparation, and practice will help you succeed. There are three recent articles about caffeine that are being discussed in the news. The bottom line: if you are drinking moderate amounts of coffee (less than five cups per day), don't drink them too late into the day, and are experiencing no side effects (such as anxiety, palpitations, racing heart, or unexplained elevated blood sugars as a stressed person with diabetes), then don't worry! Worry more about what you PUT in the coffee - go easy on the fat and sugar. In short, no. In people who are already susceptible to hallucinations, however (about 3% of the population), caffeine may increase hallucinations. Researchers postulate that since caffeine increases cortisol release in people already under stress, that somehow the combination of caffeine, stress, and cortisol, leads to the findings. It is important to note that caffeine on top of stress causes increased cortisol release. This could explain why some patients with diabetes note increased blood sugars after caffeine consumption. As noted below, however, some studies show DECREASED risk of type II diabetes with daily coffee consumption. Can Coffee Ward Off Dementia? “Drinking coffee in moderate amounts during middle age may reduce the risk of dementia and Alzheimer's disease in the elderly, according to a new study. Researchers in Finland and Sweden examined the records of 1,409 people whose coffee drinking habits had been recorded when they were at midlife. …In the study, participants were asked in 1972, 1977, 1982, or 1987, when they were all in midlife (average age 50), how much coffee they drank. Then they were split into three groups: low coffee drinkers (zero to two cups per day), moderate coffee drinkers (three to five cups per day), and high coffee drinkers (more than five cups per day). The researchers note that previous studies have shown that coffee drinking improves cognitive performance, and caffeine reportedly reduces the risk of Parkinson's disease. The researchers say it's not known how coffee would offer protection against dementia, but that coffee drinking also has been associated with a decreased risk of type 2 diabetes, which is a risk factor for dementia. The authors speculate that the effect may have something to do with coffee's antioxidant capacity in the blood. Bottom line: after learning something new, take a nap! It helps your brain “consolidate” the new memories, so you keep them for the long term. If you have caffeine, it may impair the “memory making” process. Evidence suggests that caffeine interferes with tasks that require processing explicit, as opposed to implicit, information - like recalling a specific word, versus remembering how to type or ride a bike. Studies show that consolidation of such explicit verbal memory during sleep depends on lowered levels of the chemical messenger acetylcholine in the brain's memory hub. Yet, by blocking activity of a natural sedative chemical, caffeine boosts acetylcholine in this hub. No caffeine before bed or naps, if you want to learn most effectively. “Just Do It.” We’ve heard the expression, and have probably told ourselves this many times, when trying to overcome procrastination, and work on healthy eating, exercise, and lifestyle. Now a new study shows that there are some very specific ways we can turn our goals into realities. A new study in the December 2008 edition of Psychological Science shows that people are more likely to procrastinate when they think of things in an abstract way, rather than focusing on concrete, specific tasks. The study also suggests that people are more likely to get started if they focus on HOW to do something, rather than WHY they should do it. And finally, people are more likely to get started if they have a deadline. The study shows that students who answered the more abstract questions were much more likely to procrastinate -- that is, delay their answers. The researchers found that students who were focused on the concrete technicalities of a task, such as how to open a bank account, answered more quickly. The study suggests it's easier to handle a question of how than one of why. "Merely thinking about the task in more concrete, specific terms makes it feel like it should be completed sooner," which reduces procrastination, the researchers write. When it comes to weight management, the old-fashioned medical approach of “scaring people straight” - by warning them all the of the dire consequences of their weight - is not as effective as focusing on the specific things that should be done. The other old-fashioned medical approach - just telling patients to eat less and move more - also would appear to be an ineffective way to help motivate people. A better approach, supported by this study, would be to get to know an individual’s unique needs, then create very specific, detailed goals. The next crucial step is to set a follow-up appointment to create a “deadline”, to help motivate people to adopt a healthier lifestyle. 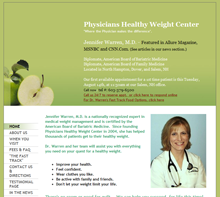 This is the approach that we have found works best with our own patients at Physicians Healthy Weight Center. Broad, vague advice to “eat less and exercise more” is next to useless. On the other hand, concrete, personalized advice, tailored to the individual, helps people get started. Having support at a followup visit is also critical to our patients’ success. Many patients admit that the positive, supportive “accountability” is a key factor in helping them improve their lives. Lifestyle change is not an easy process, but it an achievable goal! There are so many diet books and diet advice floating around out there - it can all become very confusing! Here are links to interviews with two experts who try to clear the air. "The truly good fats are not so much the unsaturated fats as the omega-3 fatty acids you find in fish oil and salmon and in some plant-based foods like flax. Part of the problem when you eat unsaturated fat is that much of the unsaturated fat people consume is rich in the omega-6 fatty acids, which promote inflammation and autoimmune responses. The truly good fats are not so much unsaturated fats as omega-3 fats. And you don't need that much of it. You can take 3 or 4 grams a day of fish oil and that is really what most people need. And you can also buy the fish oil that has all the bad stuff in fish removed -- the omega-6, the PCBs, the dioxins, and the mercury. Then you get all the benefits of eating the fatty fish but without the extra toxicities that are found in most fish these days." "Soluble fiber, in things like oat bran, is important for lowering cholesterol levels. It has a direct effect on cholesterol metabolism in your bile and in your liver. Insoluble fiber is important for two main reasons: First, because it helps to push food through the intestinal tract faster. Second, fiber affects your blood-sugar levels. The difference between refined carbs and complex carbs is that the complex, fiber-containing carbs aren't just not bad for you -- they are truly good for you. When you go from white to brown rice or from white flour to whole-wheat flour, you are going from bad carbs to good carbs. That does two good things from a weight standpoint. You fill up before you get too many calories. And you slow the absorption of foods into your bloodstream. If you eat high-fiber carbs, your blood sugar level goes up a little and stays there -- so you're getting a good source of energy. But bad carbs get absorbed very quickly. Your blood sugar is going to zoom way up. Your pancreas pumps out insulin to bring it back down, and the insulin accelerates the conversion of sugar into fat. This causes all these swings in energy. Your blood sugar doesn't just go back to where it started before it got too high -- it goes way down. That increases your carb craving, and you're stuck in a vicious cycle. It is not necessary to avoid bad carbs altogether, but to limit them and use them in combination with other foods. If you're going to have dessert, have it after a high-fiber meal. Don't have it on an empty stomach." At Physicians Healthy Weight Center, we bring you the latest research on nutrition and health, provide you with a range of choices, and work WITH you to develop the best eating plan for YOU. The good news is that even moderate movements toward healthier eating, exercise, and lifestyle can significantly improve your health and life! Losing weight can be hard. Maintaining weight loss can seem even harder. Here are some tips that can help you lose weight NOW, and help you keep it off for the long term. Studies have shown that some ways of eating will help keep you full and satisfied, and will naturally control and suppress your appetite. If you have medical conditions which require a special diet, please follow the guidelines by your healthcare provider; in general, however, these tips can be useful for almost everyone. 1. Eat breakfast. Studies have shown that eating breakfast which contains low fat or fat-free protein, can help you feel more full all day. Include plenty of fiber (found in WHOLE grains, vegetables, and whole fruit - not just the juice), and you will stay even more full. Include a small amount of "good fat" for extra appetite control. Examples: whole grain cereal, skim milk, blueberries, and some chopped walnuts; fat-free Greek yogurt with raisins and slivered almonds; egg white scramble with vegetables, and a side of whole wheat toast with Benecol or Take Control spread. 2. Plan ahead for your meals and snacks, and bring them with you so you don't have to raid the vending machine, or eat out in a place that doesn't offer healthy food. Eat healthy meals and snacks throughout the day, and try not to go longer than four hours without eating. This will keep you from getting too hungry, and overeating later in the day. Make sure each snack and meal has some protein (at least 10 grams per snack), and ideally some fiber. 3. "Don't invite the enemy to the table." Or to your car, or your desk... If you know that certain foods or snacks "trigger" you to overeat (think potato chips), keep them away! Don't try to challenge yourself to see if your willpower will win - why make life more difficult?! If a family member or co-worker keeps unhealthy "trigger" food around, try to hide it from your sight. You can put it away on a top shelf, tie it in a white plastic bag so you can't see it, or just stay away. Remember, if you can't get to it, you can't eat it! Studies have shown that people eat less candy when they merely push the candy dish out of reach on the other side of a desk! 4. Eat the healthiest foods first. Start your meals with lower calorie, higher volume foods, that ideally contain fiber and protein. Examples are soup (broth-based, low sodium), chili, or a green salad with grilled chicken. Studies have shown that people who start meals with broth based soup eat 30% fewer calories during the rest of the meal, without even trying! Fiber, high-water content foods, and lean protein actually signal your brain to eat less. These can act as natural appetite suppressants. DO NOT start your meal with refined carbs (like white rolls or low fiber crackers) and saturated fat (like butter) - you'll end up eating much more! 5. Pay attention to how much you are eating. It is possible to eat too much of a good thing! If you are trying to lose weight, total calories DO count, and people who count calories (along with paying attention to balanced eating) are going to do the best. If you are not ready to count calories, at least portion your meals out on your plate - 1/2 the plate with non-starchy vegetables (or some fruit), 1/4 of your plate with whole grains or starchier vegetables (like sweet potatoes), and 1/4 of your plate with lean protein. Don't overload your plate - you can always go back for seconds if you are truly hungry. DO NOT eat out of a box or bowl- you'll have no idea how much you are eating, and will likely overeat. Other tactics to stay aware: eat with the lights on so you can see your food, and avoid distractions such as television. You will actually experience your food, instead of unconsciously scarfing it down! Of course, check with your health care provider before starting any exercise program. For healthy people with exercise clearance, exercise can do more for your health than almost anything else! The trick is to start gradually, find something that doesn't hurt, that you don't dread, and then make activity part of your day, almost every day! 1. If you are sedentary, or do not have a formal exercise program, begin by adding a minimum of 10 minutes per day of "scheduled" exercise, like walking, riding an exercise bike, dancing, swimming, etc. It doesn't sound like much, but studies have shown it WILL give you health benefits! Before long you will notice it gets even easier, you'll begin to have more energy and endurance, will feel better, and will find yourself adding a little more. If possible, try to get 10 minutes in first thing in the morning - everyone is an individual, but studies have shown that people who exercise in the morning are more likely to keep up with it long term. 2. Long term exercise goal: "heart pumping" exercise 30 to 60 minutes five or more days per week. You can achieve maximal health and weight control by gradually building up your time - but the good news is that you can break your exercise into three 10 minute sessions, or two 15 minutes if that is easier! "Heart pumping exercise" is any activity that gets you breathing a little harder. Check with your doctor, but generally you can use the "talk test" to see if you are working out properly. You SHOULD be able to talk in full sentences without gasping, but should be working hard enough that you would rather not have a deep conversation! 3.Your next goals are to add strength (resistance) exercise, and balance exercises. If you are new to these, do not try to do them on your own. A personal trainer or physical therapist are great resources, or you can purchase a video if you have some previous experience and know proper form. Check out collagevideo.com for videos. 4. Get active with your family. It is fun and healthy for everyone to get active together! In the winter you can build snow forts, snowshoe, sled, skate, or ski. In the warmer months you can play ball in the yard, bike, hike, play frisbee, etc. Even washing the car can be healthy and fun with the whole family involved. 5. Variety is the spice of life. Try new activities to keep it fun, stay well-rounded, avoid overworking any joint, and keep up your calorie burn. There is something called the "FITT principle" of exercise - you can break through a weight loss plateau by changing your exercise Frequency, Intensity, Time, and Type. It is one thing to "know what to do", and another thing to keep doing it! Here are some tactics that have been shown to help people stay on track. 1. Pay attention to "triggers" that push you toward unhealthy choices. Most of us who struggle to stay on track with healthy eating and exercise have factors in our life which push us toward unhealthy behavior. Keep a journal to start to learn about your "triggers". A trigger might be the sight or presence of junk food, a stressful person or situation in your life, some basic need not being met in your life (lack of sleep, all work and no play, lack of creative outlet, social outlet, spiritual need, or some other basic need), loneliness, boredom, disruption in your routine, lack of planning, etc. Look at times that you HAVE been able to take care of yourself - and then try to figure out what threw you off track. Often it is one particular trigger, over and over. Once you know the trigger, you can start to plan to deal with it. 2. Make yourself a priority, and TAKE time to take care of yourself. Remember, you can't take care of everyone else, if you are unhealthy. Besides, you DESERVE to take care of yourself! 3. Do what you can to lower stress during your day. Time out for yourself, exercise, slow deep breathes, meditation, self-hypnosis, calling a friend, laughing, just taking a break and getting away from whatever is stressing you can all help! Don't feel guilty - just do it! 4. If you feel a craving coming on - distract yourself, and quickly! Get out of the room, away from the "danger", go out for a walk, call a friend, put on music and dance or clean your house, run an errand, hop on your exercise bike, etc. You get the idea. Try to do something that is a "non-compatible activity with eating" - you can't easily ride a bike and eat a hot fudge sundae at the same time. Another trick it to distract your mouth - with a piece of minty gum, Listerine Pocket Paks Breath Strips, or Sugar-Free Halls Mentho-Lyptus cough drops. Snacks won't taste quite so interesting after these! 5. Pat yourself on the back every time you make a healthy choice. Whether you have shopped and stocked up on healthy food, planned out your healthy meals and snacks, laid out your sneakers to work out first thing in the morning, or successfully distracted yourself from your cravings, stop for a minute and say "Darn, I'm good!" Get good at patting yourself on the back! Take yourself out for some new clothes, CD, craft supplies, sports equipment, or jewelry to celebrate your successes! After reading that title, you might be asking, “the Bio-Psycho-Social” WHAT? Don’t panic. The Bio-Psycho-Social Model is a concept that has been used in Family Medicine for years. It is a way of looking at the “whole person”, recognizing that the health of an individual results from interactions between the body, the mind, and the environment. In order to control our weight for the long term, we need to become aware of our challenges in each area. Once we identify our individual factors, we can create a plan to address them, and move forward toward a healthier life. Let’s take a look at common challenges, breaking them down into the categories of Biological, Psychological, and Social. This category includes many factors that can affect weight: genetics, metabolism, medical conditions (insulin resistance, hypothyroidism, etc) , medications (some of which slow metabolism and promote weight gain), body type (apple or pear shape), body composition (amount of body fat vs lean muscle), genetically influenced appetite/food preference, nutritional issues including deficiencies (such as vitamin D deficiency) and imbalances which may worsen appetite or insulin resistance, etc. This category of challenge is best examined through a full medical and bariatric evaluation, including analysis of family history, personal history, medications, medical conditions, physical assessment including vital signs, measurement of BMI, body fat percentage (different from BMI), physical exam, and bloodwork. In my practice I have found many patients with undiagnosed or undertreated hypothyroidism, insulin resistance, pre-diabetes, diabetes, vitamin D deficiency, hypertension, metabolic syndrome, depression and anxiety, among other problems, which may contribute to further weight gain and illness if not treated. I have found many patients taking medications which can lead to weight gain. Often other medications are available which do not contribute to weight gain, and may even help patients lose weight. It is also important to learn how to control the appetite center in your brain, by making certain food and behavior choices. Eating the right foods, at the right times, can control your appetite almost like an appetite suppressant! Appetite hormones such as leptin, ghrelin, and CCK can all be affected by your choices. It can sound complicated, but is actually quite easy to put into practice. The key is to create an eating plan that is “easy and automatic”. Our nutritionist helps our patients do this every day. This complex area includes self-image and self-esteem; body image; mood; emotional eating; stress and skills for stress management; developing an awareness of current habits, and learning how to make and solidify new habits. Important issues include: positive self-talk versus a negative attitude (your internal dialogue); breaking the behavior chain that leads to poor choices; recognizing sabotage from friends/family/co-workers, identifying any fears (such as fear of food deprivation), and recognizing tendencies to regress to old habits when under stress. Once we become aware of these influences, we can gain control over our lives and choices. Unfulfilled spiritual or creative outlets, lack of sense of belonging or contributing to society, loneliness, or lack of direction can also lead to overeating, and poor health. Once these issues are identified, steps can be taken to fill these needs. b) Stressful Environments. High levels of family or work stress can lead to compensatory, “comfort” eating. Financial stress, lack of sleep/exercise/recreation/private time to recharge the batteries, overwork, the care-taker role, or lack of control in life can increase the drive to eat. Once the environmental challenges are identified, plans can be made to either change the environment, or develop healthy coping mechanisms to deal with the environment. c) Lack of activity in daily life. In the "good ol' days" children played outdoors, while adults stayed active by hunting and gathering! In modern society, children are often locked inside for safety, tight school budgets have limited sports and activity, and adults are trapped for long hours at their desks, in their cars, and then collapse into their armchairs at night, exhausted. Each individual has slightly different circumstances, but most people now have to actively take charge of their exercise, and schedule it intentionally into their lives. Starting with 10 minutes of "heart pumping" exercise per day, and building gradually to at least 30 minutes, five or more days of the week, has been shown to be a remarkable health "pill". The trick is to find an activity that is relatively convenient and relatively enjoyable (well, at least not miserable and painful!) There are actually many options... from walking, biking (outdoors or stationary), DVD's, classes, team sports, even the new Wii Fit, there is really something for almost everyone! You CAN succeed, by getting to know your challenges, setting realistic goals, and being kind and forgiving to yourself. You will need a concrete, specific, realistic plan, and LOTS of support and accountability. It is important to play to your strengths, instead of focusing on weaknesses. Progress not Perfection is the road to success! 1. Sit-Stands. Move to the edge of your seat, then tighten your abs, put your hands on your hips, and simply stand up. Lower yourself back to your seat. Repeat 10 times. 2. Seated Ab Curls. While sitting, cross your arms over your chest, and sit up straight. Pull your abdominals in, then curl forward, pulling your shoulders gently downward toward your hips (this will pull the bottom of your ribcage toward your hip bones). Hold for one second, then straighten back up. Repeat 10 times. If that move isn't quite enough, try the Seated Ab Recliner instead. Sit up straight in a chair (the best chair for this is one without a backrest), raise your arms straight out in front of you, then slowly lean back as far as you can comfortably without your feet coming off the floor. Pause, and then return to an upright seated position. Repeat 10 times. 3. Desk Pushup. Stand up, and place your hands shoulder width apart on a stable surface (such as your desk, a chair, or the wall). Tighten your abs to keep your back straight, then bend your elbows to perform a slow, steady pushup. Pause when your elbows are fully bent, and then again when extended. Repeat 10 times. Let me say up front, I am not a chef. But I do love great, healthy, delicious food. There are so many terrific cookbooks and websites, but here are a couple of my favorites. This site is terrific; it allows you to create your own online recipe book, foodfile, and shopping list. Look under two sections: Healthy Meals from Day to Night, and Low Calorie Recipes. Happy New Year everyone! Eat up and enjoy!